We cherish each relationship we have established and continue to nurture it with our Priceless Pups families long after our puppy arrives home. When people adopt a Priceless Pup, they know they have the my personal support and expertise to back them up, If I don't have the answers to your questions we will find them together. I make myself available to the best of my ability despite the amount of Priceless Pups families that we serve have all over the world. The Priceless Pups extended family is growing in leaps and bounds and we have new potential clients that contact me daily and I am so proud to have established a distinct identity that separates Priceless Pups from any other website and breeders on the internet today. The biggest reason people pick the family of Priceless Pups to adopt their Shorkie puppy from is no one has or can offer the Shorkie Expertise that you get like you do at Priceless Pups. We take you on a personal journey into the world of Shorkie puppies like no other breeder can. It ensures you get a well rounded view of the Shorkie breed and the support you need through each step of the adoption process and long after you puppy is home safe and sound. We are constantly trying to make a difference in the Shorkie world of breeding and stand out amongst breeders with our Identity to ensure NO ONE confuses with any other breeder. We come up with ideas that clearly set us apart from anyone else and show case not only our expertise in Shorkies but are ability to ensure we match you with the right puppy. Now this is where we have to make a distinct clarification and draw a line clearly in the sand. For families that purchased a Shorkie puppy from PET STORE or a breeder that is not a Shorkie Club Of America Breeder PLEASE READ! We get so many calls from people that have bought a Shorkie elsewhere( other breeders, petshops etc...) and then call us for help. Either the shorkie has health issues or they are having temperament issues and are reaching out to me in hopes that I can help them. They are often surprised or a bit taken back by my answer and my answer is always the same , Go back to the breeder you got your puppy from and bring them your concerns or issues as I know nothing about the breeder or the puppy.The breeder you bought your puppy from needs to be held accountable for the the little lives they brought into this world. Just as I am here to take care of my puppies and my families that adopt from me, your breeder that you chose should do the same. If you bought a Shorkie puppy from a PET STORE contact the pet store and demand the breeders information. ( MOST LIKELY you will not get it) I cannot and will not comment on another breeders dog or puppy that is not from myself or one of my breeders in the Shorkie Club of America, nor am I a vet that can offer an medical advice on puppies I know nothing about. If you have bought a puppy from one of my breeders that is a Shorkie Club Of America breeder I will be more than glad to hear your concerns and attempt to help in anyway I can. If you have bought a shorkie puppy else where and have questions we recommend that you buy our Our Official Shorkie Guide. 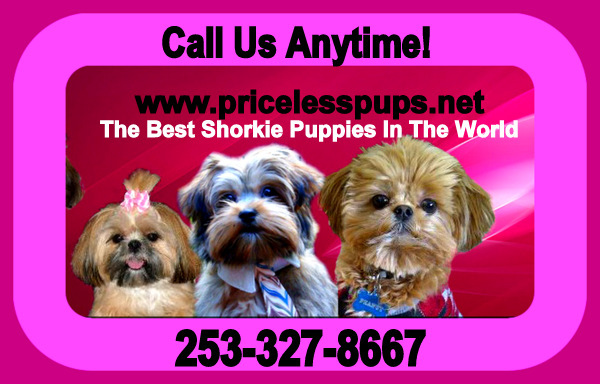 You can email me at pricelesspups@yahoo.com and Ill be glad to send you a PayPal invoice in the amount of $9.99 . Once you pay that Ill send you the book. This is my contribution to those who opt to get a Shorkie elsewhere. I wish you the best of luck with your new puppy and many years of happiness and joy and hope the breeder you chose is a responsible one and will help you with any concerns you have have. Our website is also a FREE WELL of FREEinformation our site that is available for everyone. So please take your time through the site as it will answer many of your questions incase the breeder or pet store you bought your dog from will not assist you. But that is all I can offer. If you have a litter of Shorkies whether they are accidental or planned contact your vet for any question you may have in regards to this situation. I am not a vet and cannot offer information to help you. If you had a littler of Shorkies and are not a SCA breeder. Please do not call me.. call your vet.